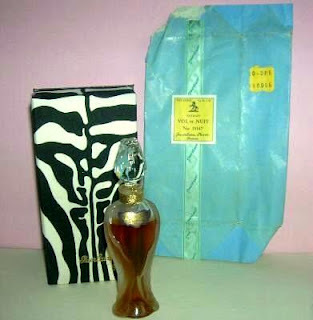 Used for extraits from 1955 til 1982. 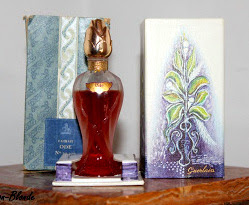 Also known as Flacon Ode as it was first used for the perfume Ode. The frosted and clear glass bottle is in the shape of an amphora with draped motifs and topped with a stopper molded in the shape of a rosebud. 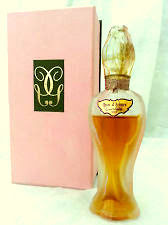 Some early bottles (1955) will have a gilded plastic rosebud screwtop. 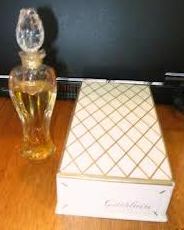 Bottle made by both Baccarat and Pochet et du Courval. 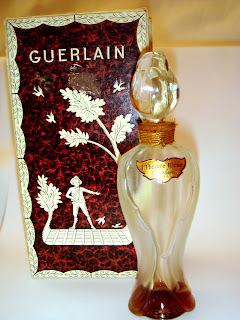 I have also listed the most common and the most rare perfumes that can be found in this bottle. 15cc/15ml/0.5 oz - 11.5cm/4.53" (1959) ground glass rosebud shaped stopper, changed to plastic rosebud screwcap in 1978.